Thought to date back to the early 1500s, Soller’s Hope Court is a traditional black and white timber-framed house with two impressive chimneys rising high above the roof ridge line. Most likely extended in the 18th century, the house now provides very comfortable family accommodation, with generous ceiling heights. With good character features including beams, and ancient timber stud partitioning, the herringbone brickwork on the first floor is of particular note. Accommodation in total comprises: entrance hall, drawing room, smallbone kitchen/breakfast room with Aga, walk-in pantry and store room with bread oven; the master bedroom and three further bedrooms are upstairs. Outside are a range of outbuildings, and a granary building suitable for further accommodation. The stable yard has seven loose boxes, hay barn, field shelter and a manege. The tack room is within the main house. The grounds come to around 12 acres and feature a duck pond and landscaped gardens in addition to the paddocks. 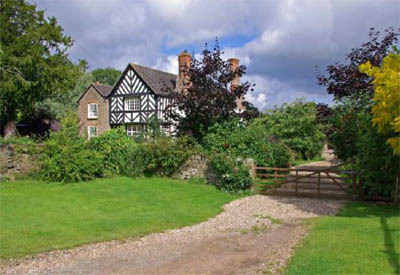 Sollers Hope Court is located just over two miles from the old village of Fownhope which lies on the old road between Gloucester and Hereford, and has a small and thriving community with a post office and local stores. The main shopping centres for further amenities are Ledbury, Monmouth and Cheltenham. Ross-on-Wye is 7 miles and Ledbury just 8 miles. information please contact Savills on 1242 548 000 or visit their website.